hmm i couldn't have thought of something like this..
would have been more useful if we could target any special div maybe like for example my comments div or any thing that is user generated.. Thanks for the script. I have never seen such great script. Thanks. I will recommend your site to my friends. I been looking around for this for a while and at last find it here. 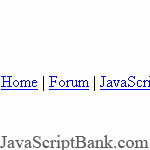 thanks for sharing such valuabale information ..
Nice JS script there, thanks for the sharing! Will save this for my future use. Usually these days don't people find it annoying when links open in new pages? I personally do, and if I ever decide I want something to open in a new window, I right click it! Simple, short but to the point. Very nice and useful code that will make things easier. This website is a great one stop resource for java related code! Thanks!